Caprock is a rock that prevents the ﬂow of a given ﬂuid at a certain temperature and pressure and geochemical conditions. For a long time, the only force causing the movement of oil and gas in the subsurface was believed to be buoyancy. If so, then to form oil and gas accumulation, their migration paths must have been stopped by a roof, i.e., caprock (seal). Clays, shales, carbonates, evaporites, and their combinations can form caprocks. The same rocks react differently to different ﬂuids. In some cases, rocks serve as satisfactory or good conduits for water, but form barriers for oil or gas movement. In some other situations rocks yield oil but stop gas movement, etc. This is determined by capillary forces, the magnitude of which depends on ﬂuid and rock properties (ﬂuid density, ﬂuid viscosity, rock structure, rock wettability) and pore size (capillary forces almost disappear when the pore diameter exceeds 0.5mm). All aforementioned rock and ﬂuid properties are strongly affected by the subsurface temperature and pressure and geochemical environment. Caprock is a rock that prevents the ﬂow of a given ﬂuid at a certain temperature and pressure and geochemical conditions. Therefore, the necessary properties of a rock to act as a seal will be different for different ﬂuids. The same rock with different ﬂuids may or may not have sealing properties up to a complete inversion (caprock - reservoir). The caprocks can be categorized into three types. Type I caprocks are typical for argillaceous sequences in a state of continuing compaction; they are developed in areas of young subsidence of Earth’s crust, with abnormally high pore water pressure. Sealing properties of these rocks are determined by the amount of capillary pressure at the contact of the reservoir and caprock, the pore pressure of water saturating the caprock, initial pressure gradient of water and the variation of hydraulic forces in the section. Oil and gas accumulations have higher potential energy than that of the formation water. These accumulations can be stable only if this energy is equal to or less than the caprock breakthrough energy. Pore water pressure in compacting argillaceous beds is always greater than the pressure in the adjacent reservoir beds. As a result, sealing capability of the Type I caprocks is determined by hydraulic sealing, by the amount of capillary pressure, and by the pressure at which water begins to ﬂow through caprocks. Just the capillary pressure alone in such caprocks may exceed 100kg/cm2. This means that the Type I caprocks is capable of conﬁning an oil accumulation having almost any column height. It appears that sealing capability of argillaceous caprocks does not depend on their thickness describes only the aforementioned caprock type. Type II caprocks are associated with rocks compacted beyond the plasticity limit and having lost ability to swell on contact with water. Such rocks do not contain swelling clay minerals, and interstitial water contains surfactants. Consequently, pore water in these rocks does not have initial pressure gradient. This type of caprocks is encountered mostly in the Paleozoic and Mesozoic sediments of young and old platforms. There are no clear-cut overpressure environments there, but there is a relatively clear hydrodynamic subdivision in the section. the hydrodynamic environment may improve or lower the sealing capability of caprocks. In an extreme case, the water potential in the reservoir may exceed the water potential of the bed overlying the caprock by the value of capillary pressure. In such a situation, the caprock will be open for the vertical ﬂow of hydrocarbons, and the trap will not exist even when potential distribution in the reservoir bed is favorable. Type III caprocks are typical for rocks with a rigid matrix and intense fracturing. Such caprocks are mainly developed over the old platforms in regions of low tectonic mobility, with no detectable hydrodynamic breakdown of the section. Formation water potential in such regions is practically equal throughout the section and corresponds to the calculated hydrostatic potential. The correlation between clay mineralogy and their sealing properties are as follows "The permanency in the composition of the silicate layer is a characteristic of the kaolinite group minerals. As a result, replacements within the lattice are very rare and the charges within a layer are compensated. The connection between silicate layers in the C-axis direction is implemented through hydrogen atoms, which prevents the lattice from expanding, ruling out the penetration of water and polar organic liquids. The silicate layer in the montmorillonite mineral group is variable due to a common isomorphic replacement in octahedral and narrower tetrahedral sheets. This replacement results in the disruption of the lattice neutrality. Extra charge that occurs with such replacements is compensated by exchange ions. Ion properties that maintain lattice neutrality in montmorillonite minerals (valence, size of the ion radius, polarization, etc.) deﬁne the capability of the lattice to expand along the C-axis. As a result, water and polar organic liquids can penetrate the interlayer spaces. This, in turn, leads to an increase in the volume, which drastically lowers permeability and some other properties, but at the same time improves sealing capabilities. The silicate layer of the illite mineral group is similar to the montmorillonite one. However, the excessive negative charge of the lattice is due mainly to the isomorphic replacements within tetrahedral sheets. The proximity between the source of negative charge and basal surfaces causes a stronger connection between the silicate layers of illite group compared to montmorillonite’s." Admixture of sand and silt degrades the sealing properties of clays. Especially important are the textural changes due to this admixture. Not only the mineral composition of a rock and organic matter content, but also the pore water are important in forming the major sealing properties of clays, such as degree of swelling and compressibility. The relatively low-temperature pore water is retained in argillaceous rocks up to a temperature of 100C to 150C. The temperature of water removal is higher when the concentration of dissolved components is higher. Pore water is located within pores of argillaceous rocks, and at the surfaces and along the edges of individual microblocks and microaggregates that comprise clays. The interlayer water causes swelling in montmorillonites and in degraded illites. The order in water molecules positioning, relative to the clay mineral blocks and aggregates, is rapidly altered with an increase in distance between these blocks and aggregates. Thus, a very important information for the evaluation of the role water plays in the formation of sealing properties is the knowledge of the structural status of the layer in an immediate contact with the particles surface, and the role the cations having different charge density play in the preservation of water molecules structure. Exchange ions play a leading role in the formation of "water clouds" around microaggregates and microblocks of montmorillonite minerals and an insignificant role, with kaolinite minerals. The role played by the illite group minerals occupies an intermediate position. Carbonates caprocks include micro- and ﬁne-grained, massive and laminated limestones. Almost all limestones are dolomitized to some extent and are subject to fracturing. This adversely affects their sealing properties. Carbonates with a substantial clay content have laminated texture. As a rule, this results in a deterioration rather than an improvement of sealing properties due to the emergence of weakness zones at the contact between different lithologies. Evaporite seals, which are common, include salt, anhydrite, and sometimes shales. It is a common (and probably erroneous) belief that such seals are the best and most reliable. Brittleness of these rocks at the surface conditions contradicts that belief. Besides, cores recovered in the Dnieper-Donets Basin and North Caspian Basin display macro- and microscopic fractures, which sometimes cut monolithic salt crystals. The fractures may be healed by secondary salt, but often contain traces of oil and sometimes gas bubbles. Sometimes core samples are completely saturated with oil. Permeability measured at the surface conditions can reach 100–150mD and even higher. It was established, however, that these rocks easily become plastic even at a relatively low hydrostatic or, even, uniaxial pressure (o100MPa) and the properties change with temperature. Some people considered plasticity as an important sealing property. In this connection, they believe that salt has the best sealing properties. They also believe that the reliability of caprock is not directly related to its thickness. Thus, properties of evaporites as seals change widely during the catagenesis (and in time). Similar changes also affect the other types of seals albeit not so obviously. Inclusions, such as organic matter, silt, clay or carbonate particles degrade sealing properties of evaporites due to the formation of zones of weakness around such inclusions. A careful study of numerous logs from Dnieper-Donets Basin showed the presence of clay interbeds between the top of accumulation and the evaporite sequence in all cases. It appears that these interbeds in most cases act as caprock. Selecting the right technique or combination of techniques is always a trade-off between speed, cost, required sample quality, sample volume; logistics and environmental considerations. Augering and RAB drilling provide relatively low levels of geological knowledge but are quick and cheap and so are useful principally as geochemical reconnaissance tools for collecting samples below areas of shallow overburden. Large rotary percussion rigs can quickly drill a large-diameter hole (100– 200 mm) with good sample volume and at reasonable cost. They are powerful machines capable of penetrating much deeper and through harder rock than the RAB rig. 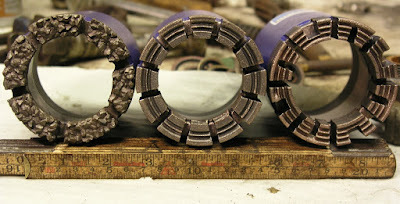 However, in normal rotary percussion drilling, the long sample return from drill bit to the surface along the outside of the rods may produce contamination from the walls of the hole. This problem can be especially acute when dealing with the low and often erratic concentrations typical of gold mineralization. 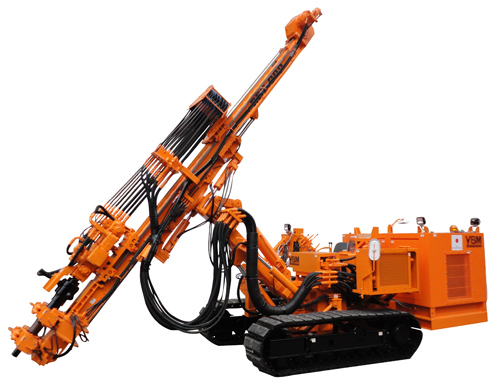 The sample recovery system used in the RC drill rig is designed to overcome the contamination problem and for this reason RC rigs are nowadays speciﬁed in most rotary percussion drilling programmes. 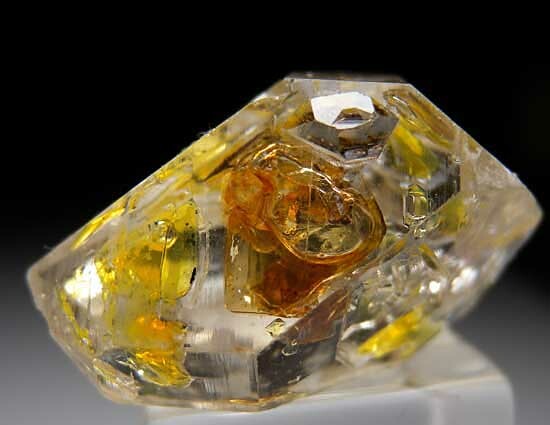 Diamond drilling provides the premier sample for both geology and geochemistry. A diamond impregnated cutting bit produces a solid cylinder of rock. The rock sample can be obtained from any depth that is capable of being mined. Diamond drill core permits sophisticated geological and structural observations to be made, and can also yield a large-volume, uncontaminated sample with high recovery suitable for geochemical assay. Drill core can be oriented permitting structures to be measured. Diamond drilling is also the most expensive technique. As a general rule, for the cost of 1m of diamond drilling, up to 4 m of RC or 20 m of RAB can be drilled. From almost all points of view, the larger the core diameter the better. Large diameter holes provide better core recovery and deviate less. Lithology and structure are much easier to recognize in the larger core sizes and a larger volume sample is better for geochemical assay and ore reserve calculations. However, as the cost of diamond drilling is roughly in proportion to the core size, a compromise on hole size is usually necessary. 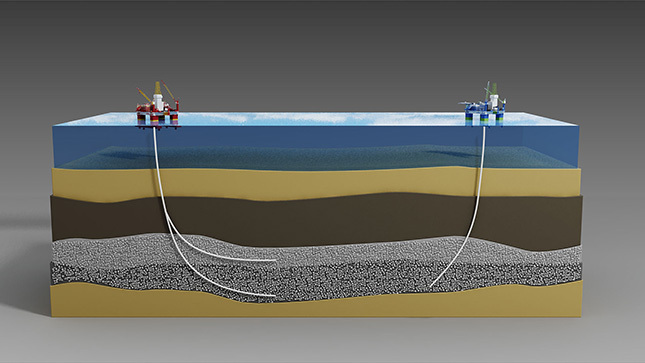 The speciﬁc requirements of an exploration programme play a large part in the choice of drilling technique. For example, if the area is geologically complex, or the exposure is poor, and there are no clearly deﬁned targets (or perhaps too many targets), it may be imperative to increase the level of geological knowledge by diamond drilling. The geological knowledge gained from the diamond drill core can be used to help prioritize surface geochemical anomalies or develop conceptual targets. On the other hand, if discrete and clearly deﬁned surface geochemical anomalies are to be tested to see if they are the expression of blind but shallow ore bodies, it may be sufﬁcient to simply test them with a large number of RC or even RAB drill holes. In arid terrains, such as the Yilgarn Province of Western Australia, the RC drill has been used in the discovery and development of a large number of gold ore bodies within the weathered rocks of the upper 80 m or so of the surface. It has proved to be an excellent compromise between cost, good sample quality for geochemistry, and some geological return in the form of small rock chips. In spite of this success, the RC rig is principally a geochemical sampling tool and it is dangerous to attempt to deﬁne an ore body on assay numbers alone. RC drilling data can seldom give an adequate geological understanding of mineralizing processes and in most cases will need to be supplemented with detailed mapping (where outcrop is available), by trenching and/or a selected smaller number of diamond drill holes. 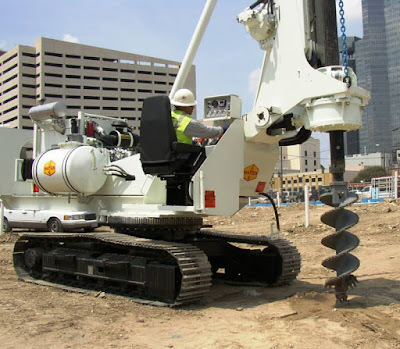 The logistical requirements of the different drilling types also play a large part in selection of the best technique. RC rigs (and the larger RAB rigs) are generally very large, truck-mounted machines which have difﬁculty getting into some rugged areas without track preparation, and cannot operate on very steep slopes. Diamond drill rigs are much more mobile; they are truck or skid mounted, have modest power requirements compared to an RC rig, and can be disassembled if necessary and ﬂown to site by helicopter. Some rigs are even designed to be man-portable on dismantling. Diamond rigs, however, require a large, nearby water source. The ability to be ﬂown or carried into a site also makes the diamond rig suitable for operation in environmentally sensitive areas. The air core machine is a compromise that has some of the features of RC, diamond and RAB drills. In ideal conditions the drill can produce small pieces of core and so provide better material on which to determine lithology and structure than normal RC cuttings. It is often capable of penetrating and producing a sample from sticky clays that might stop a conventional drill rig. As with all RC cuttings, recovery is usually good with minimal sample contamination. However, the sample volume is small compared to that from a large RC rig, and hence less suitable for gold geochemistry. Air core is usually intermediate in cost between normal RC and RAB drilling. Some available rigs are truck mounted and are capable of getting into difﬁcult to access sites. What is Petroleum reservoir and how does it stores oil? The natural subsurface reservoir is a container of oil, gas, and water where they can move, and its shape is determined by the relationship between the reservoir rock and its surrounding poorly permeable rocks. The subsurface reservoir as only that part of the reservoir rocks where the oil and natural gas can form an accumulation. The natural reservoir remains as such regardless of the type of the contained ﬂuids, or even if it is dry. A comparison can be made with the overpressure. The presence of ﬂuids is necessary for the overpressure. No ﬂuids of different densities, no surplus pressure. As for the reservoirs, they possess two important attributes: spatial limitation (which determines the volume and boundaries of the reservoir), and an internal structure that deﬁnes the type and nature of inter-reservoir migration. Indeed, these properties should be included in any definition of the reservoir as well as in the classiﬁcations being developed. 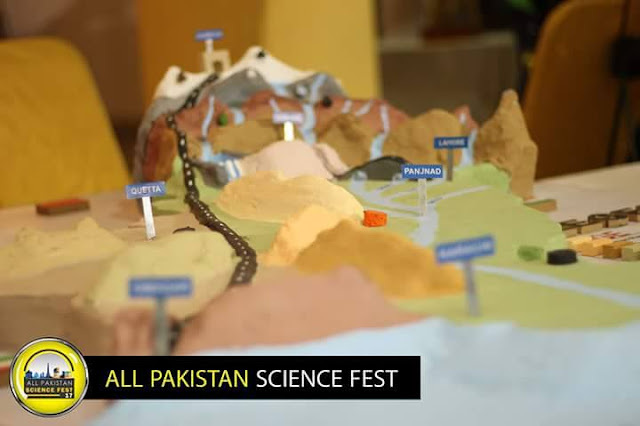 Some attempts have been made to classify the oil and gas reservoirs on the basis of their relative size (local, zonal, basin-wide, regional, etc.) or their absolute size. May change its age along the strike. It is improbable but not impossible that a reservoir may be capped by the surface of an impermeable over-thrust. It should be kept in mind the selectivity toward different ﬂuids by caprock and a possibility of its transformation into a reservoir rock during epigenesis. Consequently, it is always important to indicate the exact nature of the ﬂuid. The transformation of the caprock into a reservoir rock results in either disappearance of the reservoir or its conversion into a new reservoir (if there is another caprock above). Lateral limitations are caused by lithologic alterations (including cementation) and the permeability. Small accumulations may be laterally limited by faults. This is possible, but not typical, for the larger reservoirs, because the fault zones in their evolution can become migration paths for various ﬂuids (oil, water, or gas). 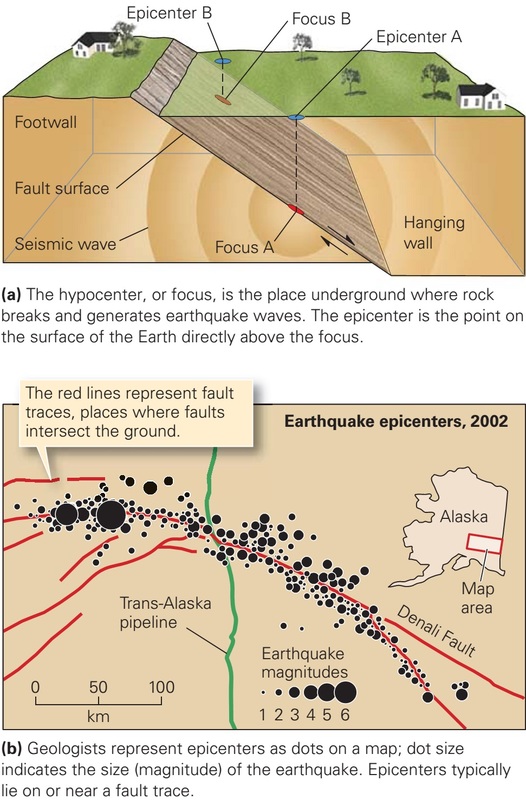 Fault zones are actually "communication windows" with the other reservoirs. The importance of the presence of the base (bottom) as a necessary reservoir component was not always clearly recognized, because it was believed that the accumulations were formed exclusively by the buoyancy (Archimedes forces). One must always keep in mind that the reservoir is an inseparable part of the hydrodynamic system. This system may be open or with a restricted communication to the surface (artesian), or of "elision" type (with an inverse pattern of hydrostatic pressure). It is not possible for such energy system to exist without a base (bottom). Reservoir rock is a rock capable of containing oil and gas and yielding them during production. The reservoir rock is characterized by: rock type; permeability type (intergranular, fracture, and/or combination of the two); the total, intercommunicating, and effective porosity; specific surface area; wettability of rock (oil-wet versus water-wet); fracture type (width, etc. ); and fracture distribution. Reservoir is a natural subsurface container for oil, gas, and water. Its existence is predicated on the relationships between the reservoir rock and associated poorly permeable rocks. Reservoir is characterized by reservoir-rock type, relationship with impermeable rocks, reservoir capacity, its hydrodynamic conditions, reservoir energy, and structure. 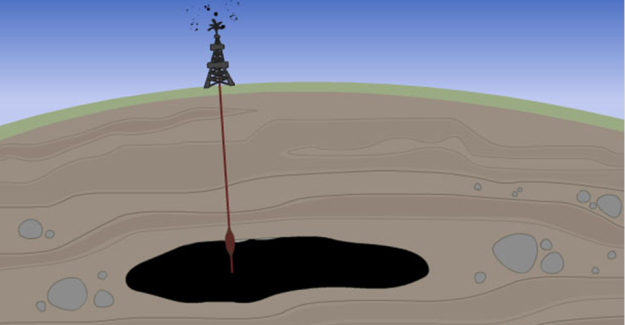 Trap is part of the subsurface reservoir where an oil or gas accumulation can form and be preserved. Its parameters include the reservoir type, reservoir-rock type, conditions of its formation, structure, and capacity. In a special case where the reservoir is lithologically limited from all directions, its parameters may coincide with those of the trap (the entire reservoir is represented by a single trap). Type of the reservoir rock comprising the reservoir. Relationship between the reservoir and the surrounding impermeable rocks. In terms of the relationship between the reservoir and its surrounding impermeable rocks, there are three major types of the reservoirs: bedded, massive, and lithologically limited in all directions. Bedded reservoir is a reservoir that is restricted at its top and base by low permeable rocks. The reservoir rock thickness in such a reservoir is more or less or at the edge of the reservoir development, which may result in a pinch-out of the reservoir rock. The reservoir rocks in bedded reservoirs are usually lithologically continuous, but may have a more complex nature. A bedded reservoir may have a single hydrodynamic system. Reservoir energy in bedded reservoirs is distributed in accordance with the hydrostatic or hydrodynamic environment of the artesian basins. However, reservoirs with that kind of energy distribution are typical only for the uppermost portion of the sediment cover. As a result of subsidence and sediment compaction and various secondary geochemical processes, reservoirs may be separated into diverse portions as a consequence of previously described phenomena. Leaving aside changes in the sediment composition, drastic changes occur in the major reservoir-rock properties (porosity and permeability). Even if prior to subsidence the reservoir rocks were reasonably uniform in terms of porosity and permeability, subsequent to subsidence non-uniformities appear between various portions of reservoir so that they may turn out to be totally separated from one another. An indication of such a change may be a change in a hydrodynamic drive from artesian to "elision" type and the appearance of abnormally high pressure. The beginning of the process involves (1) lateral ﬂuid migration, and (2) gradual change in the reservoir energy. Potential energy of the accumulations relative to the total energy of the reservoir is small. As the sheet-type reservoir differentiates, lateral migration becomes increasingly more obstructed, with formation of numerous hydraulic fractures. Fluid migration from the reservoir to other favorable zones (if they are available) may become prevalent. An increase in the elastic potential energy is observed (Abnormally-High Formation Pressure, AHFP). Energy distribution becomes discrete. The difference in potential energy between the accumulations and the reservoir as a whole becomes smaller, and within some zones (blocks) they become identical. Thus, it is reasonable to recognize a separate type, i.e., differentiated sheet-type reservoir, which under certain circumstances becomes a bedded reservoir. Massive reservoir is a thick permeable sequence overlain at the top and restricted from the sides by low-permeable rocks. Its bottom may be at a depth that has not yet been penetrated by wells (Tengiz Field, Kazakhstan). Reservoir rocks comprising massive reservoirs may be homogeneous or heterogeneous. Homogeneous massive reservoir rocks may be carbonates and metamorphic or volcanic rocks. Their porosity and permeability is due to the presence of vugs and fractures. Porous and permeable zones in massive reservoir rocks are not stratigraphically related. Isolated high-porosity and high-permeability zones cutting through stratigraphic surfaces within a body of a massif are common. Buried reefs are often assigned to this reservoir type. Among the best examples are the Ishimbay group of ﬁelds in Bashkortostan, Russia, and Rainbow Oilﬁeld in Alberta, Canada. Usually, the thickness (height) of massive reservoirs is greater than the width. The length of possible vertical ﬂuid migration is similar or greater than the lateral migration within the beds. The ﬂanks of the reservoir and its contacts with the contemporaneous sediments are steep (thus, the biostromes should be classiﬁed as the sheet-type (bedded) rather than the massive-type reservoirs). In as much as the bioherms are very similar to reef buildups, they should be considered as massive reservoirs. To form a trapping mechanism, beside the caprock, the massive reservoirs require isolating steep lateral limitations. As an example, numerous present-day coral reefs in the Indian Ocean do not form subsurface reservoirs not only because of the absence of caprock, but also due to the absence of lateral barriers (lateral isolation). Fresh water accumulating within such bodies ﬂoats on the surface of heavier seawater. The hydrodynamic system of the massive reservoirs is poorly studied. It is possible that they communicate at depth with the bedded (sheet-type) reservoirs and are, in effect, just a veriety of a sheet-type reservoir. Reservoirs lithologically limited from all directions include all types of reservoirs where the liquid or gaseous hydrocarbons present from the time of formation of the reservoir are surrounded from all directions with practically impermeable rocks. Fluid movement within such reservoir is limited by its size. There is some superﬁcial similarity between the massive reservoirs and the differentiated sheet-type reservoirs. The similarity is in the limitation (lithologic isolation). The difference is in the timing of the emergence of the latter. The massive reservoir is a result of depositional processes, whereas the differentiated sheet-type reservoir is a result of stresses during the basin subsidence. The former type is originally small (certainly, any bed is a large lens, but this approach is not used here). The latter type is a separate portion of a previous, possibly large hydrodynamic system. Prevalent elastic energy is typical for both, but the latter type of reservoirs has a greater stress level. The capacity of any type of reservoir is deﬁned by its size and reservoir-rock properties. Energy of a reservoir is associated with its capacity, and the energy is what is important for the extraction of oil and gas (and associated water). The identiﬁcation of the above four reservoir types is tentative, because such well rooted concepts as reservoir rock and caprock (ﬂuid barrier) are also tentative. Even in the same state, the same rock may be a ﬂuid barrier to one ﬂuid and a reservoir rock to the other, depending on the physiochemical properties of ﬂuids and rocks (especially, wettability), and on the subsurface temperature and pressure. For instance, a prominent projection of a massive reservoir may be just a complication of a regional sheet-type reservoir and be a part of the same hydrodynamic system. This phenomenon is especially common in carbonate sequences. It is possible to imagine a conversion of a sheet-type differentiated (block) reservoir into a massive reservoir if the caprock loses its sealing properties over a fault or ﬂexure. The hydrocarbon accumulation may then occur underneath another, shallower caprock. Inclusions of small drops of oil may be trapped in quartz cement and show up well in ﬂuorescent light. Fluid inclusion data from quartz helps to constrain the temperature for quartz cementation and in sandstone reservoirs it has been demonstrated quite clearly that quartz cementation continues after oil emplacements in a reservoir. The lowest ﬂuid inclusion temperatures in quartz cement indicate an onset of quartz cementation close to 70–80◦C. In the Ula Field (North Sea basin), ﬂuid inclusion temperatures in quartz cement range from 86◦C to 126◦C, the highest temperature being close to the present day reservoir temperature which is also the maximum burial depth and temperature. Fluid inclusions from 24 samples from 11 different reservoir units from the North Sea and Haltenbanken also show temperatures from about 80◦C to values close to the present reservoir temperatures. This shows that quartz cementation occurs as a continuous process at a rate controlled by the temperature. There is no evidence that quartz cementation is episodic, controlled by the supply of silica, or that quartz cementation stops after the sandstones have become oil-saturated. In a water-wet reservoir precipitation can still continue in the remaining water around the grains. At high oil saturation, the transport of silica by advection as well as by diffusion becomes much less efﬁcient. The continued growth of quartz cements after oil emplacement results from the closed system nature of quartz cementation in sandstones. In an oil-wet system, however, quartz can not precipitate on the grain surfaces and oil or bitumen may become very effective coatings. Asphaltic oil and bitumen formed by bio-degradation or other processes may preserve good reservoir quality, particularly if the heavy oil only occurs as a grain coating. In summary, quartz cementation is controlled by the slow kinetics (high activation energy) for quartz cementation and normally a minimum temperature of 70–80◦C is required. This is however also dependent on the pH. In sedimentary basins marine porewater starts out with a pH close to 7 but quickly becomes more acid due to the build of CO2 and other reactions with the minerals present. At 3-4 km depth the pH may typically be 4.5–5 but at 120◦C the pH is close to neutral. The rate of quartz cementation is then lowered by the pH but increased by higher temperatures. At very high pH quartz cementation may occur at the surface and silcrete is ﬁne-grained quartz formed in soils due to concentration of porewater by evaporation, and quartz is also forming in some alkaline African lakes. Authigenic illite consists of thin hair- or plate-like minerals and it is fairly obvious that they would have a detrimental effect on reservoir quality by reducing the permeability. SEM images are routinely taken from dried-out cores where the illite appearance is no longer representative of its morphology in the reservoir. When cores are dried without destroying the delicate illite morphology the pore space often looks like it has been ﬁlled with rockwool. Illite can often be seen to grow at the expense of kaolinite and may also form by alteration of smectite. Although authigenic illite may also be observed on fractures and other places where there are no obvious precursor minerals, it is most commonly found as a replacement of an earlier Al-rich mineral phase. Because of the low Al-solubility in porewater, illite will in most cases precipitate where the source of Al is available locally from a dissolving mineral. Calculations suggest that the solubility of aluminium is only about 1 ppm at 150◦C and that organic acids have little effect in terms of increasing its solubility. The formation of illite from smectite via mixed layered minerals is well known and occurs in sandstones in the temperature range of 70–100◦C. Sandstones with abundant smectite are poor reservoir rocks at the outset, and illitisation of such rocks may itself slightly improve reservoir quality as illite has a lower speciﬁc surface area than smectite. In better sorted and potentially good reservoir rocks kaolin minerals (kaolinite or dickite) are the most important precursors for illite. However, the formation of illite requires potassium, and K-feldspar is usually the only signiﬁcant source present in the sediment. The reaction between K-feldspar and kaolinite occurs at about 130◦C and above this temperature these two minerals are no longer thermodynamically stable together. In the North Sea basin and at Haltenbanken this corresponds to a burial depth of about 3.7–4 km. A sharp increase in the illite content in sandstone reservoirs is observed. If the matrix is well-cemented the rate of diffusion is reduced, and the minerals are then able to co-exist at higher temperatures if they do not occur close together. In sandstones with little or no K-feldspar, however, kaolin remains stable at greater depth as it is not dissolved and replaced by illite. The formation of illite can therefore be predicted from the sandstone provenance with respect to K-feldspar supply, and from the early diagenesis and freshwater ﬂushing with respect to the distribution of kaolinite. If a sandstone is derived from an albite-rich gneiss the K-feldspar content is likely to be too low and much of the kaolinite would then not be illitised. Similarly, not much illite will be formed in sandstones with little kaolinite or smectite. Both in Haltenbanken and the North Sea there are Jurassic reservoirs where plagioclase is the dominant feldspar and where the low K-feldspar content is unable to supply the necessary potassium for illitisation of kaolinite. The low illite content in such reservoirs preserves better permeability. This is a direct function of the provenance and could be due to erosion of albite gneisses rather than granitic gneisses. The distribution of authigenic illite in sedimentary basins like the North Sea and Haltenbanken shows that illite formation is strongly controlled by the present day burial depth and temperature. The increase in illite content at about 3.7–4.0 km is usually very sharp, indicating a temperature-controlled reaction rather than a high kinetic reaction rate when the association of kaolinite and K-feldspar becomes thermodynamically unstable. Basin loading from thick Pleistocene sequences in these areas suggests that the illite formed recently. K-Ar dating of illite gives variable ages for the formation of illite. This is probably because even very small amounts of detrital (older) mica or feldspar will produce too-old ages. Bioturbation plays an important role in changing the textural composition of the sediments after deposition. The burrowing organisms eat mud and thereby oxidise organic matter and physically destroy the primary lamination. Sediments overturned by bioturbation become more exposed to oxidation at the sea or lake bottom. Bioturbation may reduce the porosity and permeability of sandy laminae by mixing clay with clean sand. Bioturbation will also destroy thin clay laminae, which may signiﬁcantly increase the vertical permeability and this may be very signiﬁcant for reservoir quality. 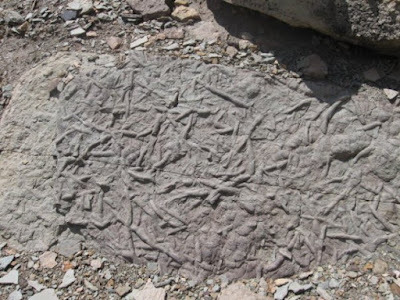 Undisturbed primary lamination may be evidence of rather rapid sedimentation giving little time for a burrowing bottom fauna to become established, or alternatively indicate strongly reducing conditions restricting the fauna. Black shales usually have well preserved lamination due to lack of burrowing organisms. The presence or absence of burrowing also inﬂuences the physical properties, particularly the difference in velocity and resistivity parallel and vertical to bedding (anisotropy) and this may be important for geophysical modelling. Burrowing worms produce faecal material which may develop into smectite-rich clays, which in turn may develop into chlorite coatings, thus improving reservoir quality. Early diagenetic formation of coatings on quartz grains is extremely important due to its role in preserving porosity at greater depth. Most clastic depositional environments have some organisms producing organic matter which, at least in part, is incorporated within the sediments. Both sandstones and mudstones nearly always contain signiﬁcant amounts of biogenic material from calcareous, and sometimes also siliceous, organisms and this may later be an important source of carbonate and silica cement at greater burial depth. Marine organisms composed of aragonite dissolve during relatively shallow burial and calcite precipitates either as replacements within the fossils (neomorphism) or as cement in pore space between the grains. Carbonate cement in sandstones may form layers or concretions and in most cases is derived from biogenic carbonate, particularly from organisms composed of aragonite. Siliceous organisms composed of opal (diatoms or siliceous sponges) may be an important source of micro-quartz coatings on quartz grains at greater depth. Carbonate cements in both mudstones and sandstones are mostly due to dissolution and reprecipitation of biogenic carbonate or early aragonite cement. There are usually no other major sources of carbonate cement. In the sulphate-reducing zone, carbonate concretions form, often with a negative δ13C due to the CO2 produced during sulphate reduction. Carbonate concretions in cores may be mistaken for continuous carbonate layers but it is possible to recognise that they are concretions. Even if CO2 is generated from organic matter, there are few Ca2+ sources available in sandstones or mudstones for making calcite. Leaching of plagioclase can supply some Ca2+, which can be precipitated as calcite, but this can only account for very small amounts of the calcite observed in such sediments. 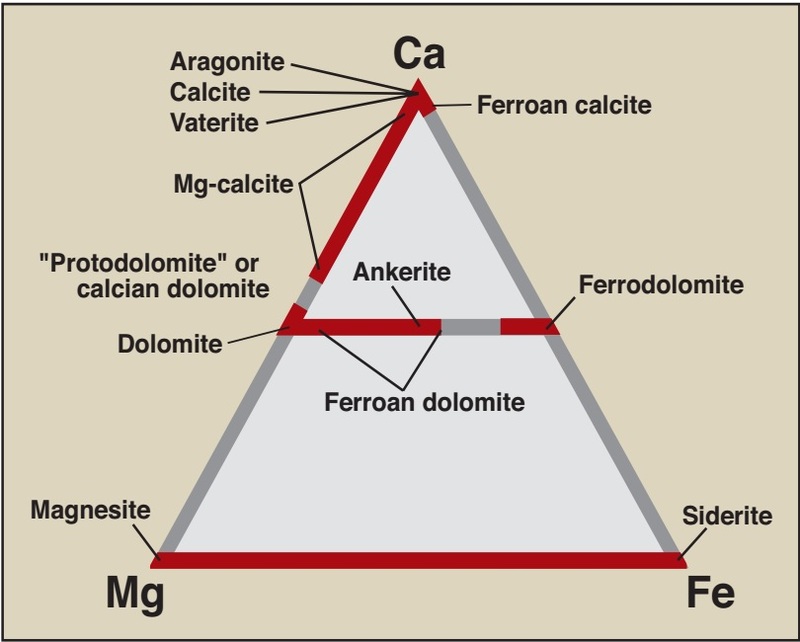 The distribution of carbonate cement is related to facies and sequence stratigraphy. The evolution of pelagic planktonic calcareous organisms in the Mesozoic drastically increased the supply of carbonate on the seaﬂoor, including in deeper waters. Before then most of the carbonate was produced by benthic organisms restricted to shallow water facies. Upper Jurassic and younger sandstones often contain abundant calcite cement due to the “rain” of calcareous algae, foraminifera and other planktonic organisms settling on the seaﬂoor. Silica-producing organisms may also be important for diagenesis and reservoir quality at greater burial. Organisms like siliceous sponges are composed of amorphous silica which at higher temperatures will be dissolved and replaced by opal CT and quartz. Diatoms and radiolarians may also be a major source of silica which will be precipitated as quartz. Diatoms appeared during the Cretaceous and have been a major source of amorphous silica during the Cainozoic. Diatoms can produce pure siliceous rocks like the Tertiary Monterey Formation of California, which is both a source rock and a fractured reservoir rock. Biogenic carbonate is in most cases the main source of calcite cement. The distribution of such cement must therefore be linked to sedimentary facies, more speciﬁcally to biological productivity relative to the clastic sedimentation rate. Environments with low clastic sedimentation rates, particularly submarine highs, often have high organic carbonate production. Across the redox boundary there is a high gradient in the concentration of oxygen and sulphate, and of ions that have very different solubilities in oxygenated and reduced water. The redox boundary is usually just 1–20 cm below the sea-ﬂoor and represents equilibrium between the supply of oxygen by diffusion, and its consumption by the (mostly biological) oxidation of organic matter. The oxygen content in the pore water thus decreases rapidly below the water/sediment interface, providing a concentration gradient for the downward diffusion of oxygen into the uppermost sediments. The rate of downward diffusion of oxygen is a function of the concentration gradient of oxygen in the pore water and the diffusion coefﬁcient in the sediments. The diffusion coefﬁcient in coarse-grained sand is higher than in mud and therefore sand tends to have a deeper redox boundary than mud. Oxygen can also be consumed in the sediments by the oxidation of elements like iron and manganese in minerals, but this is rare in marine environments and more common in continental deposits. In most marine environments there is enough organic matter to serve as reducing agents and therefore little oxidation of iron in minerals takes place, which explains why marine sediments do not normally acquire are colour. A notable exception is red oxidised mud which may form in marine environments characterised by slow sedimentation rates and low organic productivity. These muds are not very common but occur in some deep-water facies and also in shallower water environments with low sedimentation rates. Uranium is highly soluble in seawater as uranyl (UO2+) and precipitates as reduced uranium oxide (UO2) on organic matter in the water column and below the redox boundary. There is thus a strong concentration gradient transporting uranium from the seawater down into the sediments. The adsorption of uranium onto organic matter settling on the sea-ﬂoor coupled with restricted ventilation of the water above the sediment at the time of deposition, makes source rocks like the Kimme ridge shale strongly enriched in uranium, causing peaks on the gamma ray well log curve. Iron and manganese may be transported upwards through the sediments in the reduced state by diffusion and then precipitate on the sea-ﬂoor as oxides because of their reduced solubility in the oxidised state. Iron may also be precipitated below the redox boundary as iron sulphides or iron carbonate (siderite), though iron carbonates will not form during sulphate reduction. This is because all the iron will be precipitated as sulphide, which has a much lower solubility than siderite. Manganese is not precipitated as sulphides because of the high solubility of Mn-sulphides, but may be precipitated as Mn-carbonate in the reduced zone. At a depth where there is practically no more free dissolved oxygen in the pore water, sulphates can be used by sulphate-reducing bacteria. The reduction of sulphates produces sulphides such as pyrite. 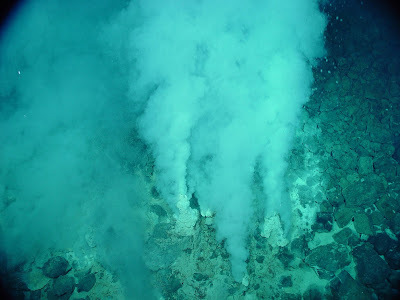 Authigenic minerals precipitating near the seabed such as carbonates, phosphates, glauconite, chamosite, sulphides and iron and manganese minerals. Meteoric water-ﬂushing causing leaching of feldspar and mica and precipitation of kaolinite beneath the seaﬂoor. The properties of all reservoir rocks are continuously changing, from the time the sediments are deposited through to their burial at great depth and during any subsequent uplift. This is a combined function of mechanical compaction and of chemical processes involving dissolution and precipitation of minerals. At any given burial depth the properties depend on the composition of the sandstones when at shallow depth, and on their temperature and stress history during burial. Practical prediction of the porosity and permeability during exploration and production is only possible if the processes that change these parameters are understood. It should be realised that the starting point for the diagenetic processes is the initial sandstone composition. This is a function of the rocks eroded (provenance), transport, and depositional environments. Diagenetic models must therefore be linked to weathering and climate, sediment transport, facies models and sequence stratigraphy, and should be integrated in an interdisciplinary basin analysis. Diagenesis is often considered a rather specialised ﬁeld of sedimentology and petroleum geology, but it embraces all the processes that change the composition of sediments after deposition and prior to metamorphism. The most important factor in predicting reservoir quality at depth is the primary clastic composition and the depositional environment. The diagenetic changes also determine the physical properties of sandstones, such as seismic velocities (Vp and Vs) and the compressibility (bulk modulus). This is also critical when predicting physical rock changes during production. Near-surface diagenesis. Reactions with fresh groundwater (subsurface weathering). In dry environments, with saline water concentrated by evaporation. Sand may also be cemented with carbonate cement near the sea ﬂoor. Mechanical compaction, which reduces the porosity by packing the grains closer together and by grain deformation and fracturing, increasing their mechanical stability. Mechanical compaction is a response to increased effective stresses during burial and follows the laws of soil mechanics. Chemical diagenesis (compaction), which includes dissolution of minerals or amorphous material and precipitation of mineral cement. The clastic minerals in the primary mineral assemblage are not in equilibrium, and there is always a drive towards thermodynamically more stable mineral assemblages. Kinetics determine the reaction rates, which for silicate reactions are extremely slow so temperature plays an important role. Precipitation of cement (quartz cement) will increase the strength of the grain framework and prevent further mechanical compaction. The sandstone is then over consolidated not due to previously higher stress, but due to cementation. Further compaction will then mostly be controlled by the rate of dissolution and precipitation. As soon as sediments are deposited, early diagenetic reactions start to modify the primary sediment composition. At very shallow burial depth (<1–10 m), sediments have the maximum potential to react with the atmosphere or water, both by ﬂuid ﬂow and diffusion. Transport of dissolved solids by diffusion and ﬂuid ﬂow (advection) is most efﬁcient near the surface; in the case of diffusion within about 1 m of the seabed. The potential for sediments to change their bulk composition after deposition is therefore much higher at shallow depth than at greater burial. Near the surface on land, and also in the uppermost few centimetres of the seabed, the conditions may be oxidising, while at greater depth in the basin they are always reducing. Precipitation of minerals due to pore water concentration by evaporation can only occur on land or at shallow depth within enclosed basins. On land, sediments are exposed to air and fresh (meteoric) water. Weathering is partly due to reactions with oxygen in the atmosphere and partly due to dissolution of minerals in freshwater, which is initially under saturated with respect to all the minerals present. 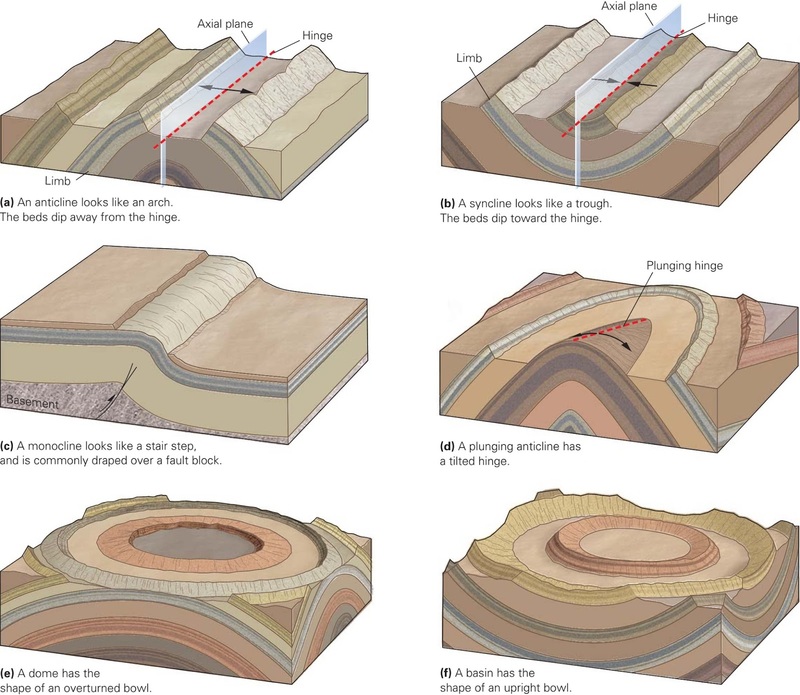 These are soil-forming processes which can be considered to be examples of early diagenesis. In desert environments groundwater and occasional rainwater may become concentrated through evaporation, causing precipitation of carbonates and also silicates. Coatings of red or yellow iron oxides and clays frequently form on desert sand and this may subsequently retard or prevent quartz cementation at greater depth. In the sea, the water above the seabed is normally oxidising. Only where there is poor water circulation (poor ventilation) is the lower part of the water column likely to be reducing, though the phenomenom is more widespread in lakes and inland seas like the Black Sea. However, even below well oxygenated water, oxidising conditions extend in most cases for only a few centimetres into the sediments, since oxygen is quickly consumed by the oxidation (decay) of organic matter in the sediment. This is for the most part facilitated biologically by bacteria. Accumulating sediments normally contain sufﬁcient organic matter to serve as reducing agents in the pore water. This organic matter is comprised of both the remains of bottom fauna and of pelagic organisms, including algae, accumulating on the sea ﬂoor, and also often includes terrestrial plant debris transported into the basin.